Privé-Swiss: The Club is an exclusive, members-only dedicated studio in our Westbrook facility, offering 24-hour private key access to a luxury workout space that is unparalleled in Connecticut. 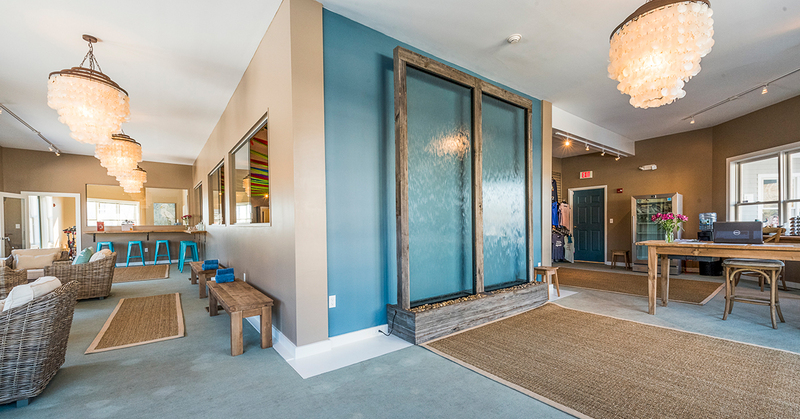 Totaling 900 square feet, the studio features a wall of windows that creates a bright, sunny space encouraged by a neutral color scheme that complements its Westbrook seaside location. In addition to the workout space, members have unlimited access to steam and infrared saunas, luxury glass rain head showers with designer amenities, a premier locker room, chilled towels infused with essential oils, fruit-infused waters and many other complimentary wellness services, such as monthly massages. •Peloton bikes, giving users access to 10+ live studio classes daily, and more than 3,000 streaming classes. The bike controls and measures resistance, cadence and output, and tracks progress against the Peloton community. •Lifefitness Power Mill (stair climber), providing climbers of all levels with access to a slow and steady ascent, or quick HIIT workout. •Lifefitness Elevation Cross Trainer, offering an elliptical machine experience that mimics natural human motion. •Lifefitness Elevation Recumbent Bike, inviting users a cardio option with relaxed seat positions and proper pedal spacing. •Lifefitness Elevation Treadmills, giving users access to three consoles to keep exercises entertained and engaged while walking, jogging or running, and careful tracking users output. •Lifefitness Arc Trainer, providing an alternative-motion cross-trainer with 21 incline adjustments to mimic gliding, striding and climbing, that exerts less stress on the knees than daily walking. •The Signature Series Dual Adjustable Pulley Weight Machine, featuring a Console touch screen with more than 60 video demonstrations showing users of all levels how to set up the machine and perform dozens of upper-body exercises. •Free weights, up to 60 lbs.